Working closely with Professor Christopher Innes, the Canada Research Chair in Performance and Culture, Alembic developed Modern Theatre in Context: An Interactive Chronology of Modern Drama, and other resources. Modern Theatre in Context is a multimedia chronology of Canadian and Western European drama. 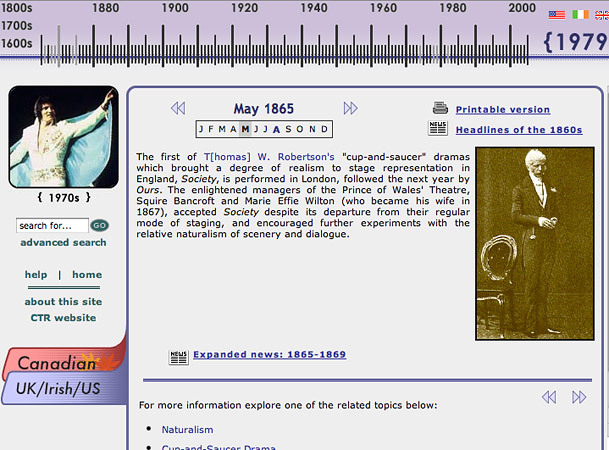 The principal chronology entries are organized along two timelines: Canadian drama, and Western European drama. Additionally, the chronology includes supplementary information entries on key genres and figures, news headlines, expanded news entries, key plays and related internal and external links. The custom content management system is designed to permit provisional inline linking to key terms for later inclusion of supplementary information. On page load, the application checks for all active content and renders the HTML accordingly. The custom content management system that powers Modern Theatre in Context facilitates the provisional inline markup of links to key terms for later inclusion of supplementary information. On page load, the application checks for all active content and renders the HTML appropriately. The application includes processes for reviewing and authorizing pending content additions and changes by senior project members, one-click migration of files from staging to live environments, and the automation of data sanitization procedures.